If you are looking for advice or pointers on your new hardwood flooring project, you’ve come to the right place. 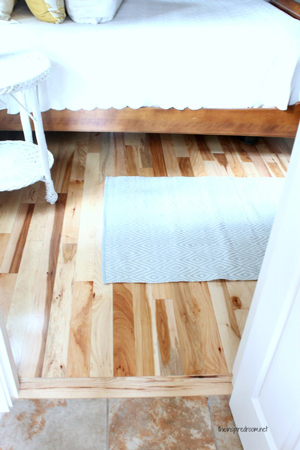 Hardwood flooring can completely change a space. It can add character to any room, from rustic and traditional to modern and chic. But just like any new flooring process, it’s hard to know where to start. That’s why Melissa Michaels is here to save the day. As the creator of The Inspired Room design and decorating blog, Melissa is a great reference for your project. She has completed both large and small projects with hardwood flooring including her own kitchen and family room. Melissa will tell you that the most important step in a hardwood flooring project is to think of the space first, and have a vision for the finished project. It is important to consider not just the color of the floor, but the color of the walls, the color of the furniture and even the color of the appliances in the room. With hardwood flooring, the color is important because hardwood comes in endless color and texture options. 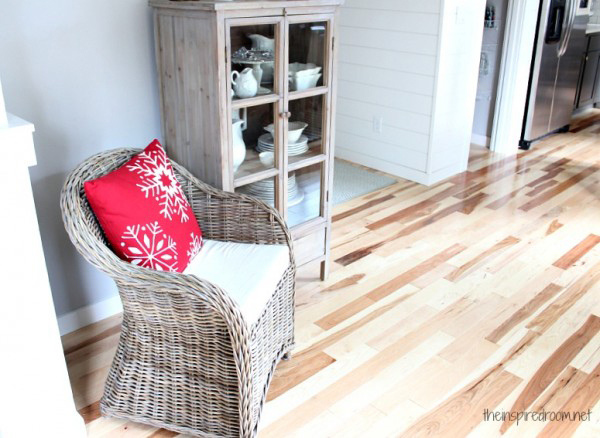 Melissa is full of ideas and inspiration for hardwood flooring. Check out this blog post of hers to see how she determined what direction to go with her home. But if you're still not sure about color or texture options, ask for professional help. Flooring retailer staff are experts in hardwood and will give you even more detailed information as well as provide you with some samples to take home to see how different colors could look in the space. Selecting the hardwood you want to install is definitely the hardest part. Once you have made your choice, it’s mostly a step-by-step process from there. Arrange a time for the retailer to drop off your new hardwood, and arrange another time for an installer to install it. The reason you need the hardwood delivered some time before installation is so the hardwood can get acclimated to the temperature and moisture level of the room. A professional installer will know the appropriate amount of time you need for this. Pro tip: Putting in hardwood should be left to professional installers. They have the proper experience, training and tools to get the job done quickly and efficiently. It may cost more, but it is more than worth the extra investment. Ask for a recommendation on an installer (or two just in case), and be sure to do a little follow-up internet research to make sure the installers you hire will do an exceptional job. Move all furniture out of the space. Make sure the installer can take out your old flooring. If they cannot, then definitely read Melissa’s blog post about getting ready for new flooring. Prepare the space. If you need to paint, paint while the room is clear and you don’t have to worry about spilling paint on your new floor. If you want to put in new light fixtures, do it while there is no new flooring to damage during installation. Remember the vision of the finished project because before you know it your vision will be a reality! Let the installers do their thing and put your new space together. Finally, enjoy your new flooring! If you want more info, check out Melissa’s story of preparing and installing her new hardwood floors, and check out her finished project here.